🍽 🥧 On this day to pause, think and savor, I'm grateful to you for reading and feeding Axios AM, and for encouraging Axios as we build the next great company. When we launched Axios AM 682 days ago, we had no idea how much hunger there would be for the efficient, clear-eyed, future-oriented journalism that my Axios colleagues are perfecting on the run. I appreciate your interest, support and encouragement. I also treasure your corrections on matters great and small, and your suggestions for how we can be more worthy of your time and attention each morning. If you hit "reply" to this email, your note goes straight to me: mike@axios.com. Wishing you a day of family peace. And thank you for the best 22 months of my life. Facebook has followed a pattern throughout its annus horribilis: Pay too little attention to a looming threat, engage too little with journalists who are on to it, then rush pell-mell to try to correct the record, calm the storm and look proactive. "We hired Definers in 2017 as part of our efforts to diversify our DC advisors after the election. Like many companies, we needed to broaden our outreach. We also faced growing pressure from competitors in tech, telcos and media companies that want government to regulate us." "Who knew about this work, and who signed off on it? Responsibility for these decisions rests with leadership of the Communications team. That’s me. Mark and Sheryl relied on me to manage this without controversy." "Did we ask them to do work on George Soros? Yes. ... [W]hen the “Freedom from Facebook” campaign emerged as a so-called grassroots coalition, the team asked Definers to help understand the groups behind them. They learned that George Soros was funding several of the coalition members. They prepared documents and distributed these to the press to show that this was not simply a spontaneous grassroots movement." Schrage's mea culpa was followed by this "Comment from Facebook COO Sheryl Sandberg:"
"Thank you for sharing this, Elliot." "I know this has been a distraction at a time when you’re all working hard to close out the year — and I am sorry." A CNN on-screen headline captures the read-between-the-lines we heard from both coasts: "Could be interpreted as a way of saving COO Sheryl Sandberg." Why this blew up, via The Guardian: "The work on Soros is sensitive because of the peculiar role that the Hungarian-born investor and philanthropist plays in rightwing conspiracy theories and among antisemites." Why the kerfuffle is arguably overblown, via Wall Street Journal editorial board member Allysia Finley: "Em­ploy­ing PR firms to shape me­dia nar­ra­tives and chal­lenge the cred­i­bil­ity of op­po­nents ... is a stan­dard busi­ness prac­tice." Be smart: Facebook seems to be adding a new realism to its founding idealism. Mark Zuckerberg, who has lost $19 billion in net worth this year (down 27% to $54 billion, according to Bloomberg), said on CNN on Tuesday: "[T]hese are complex issues that you can't fix. You manage them on an ongoing basis." 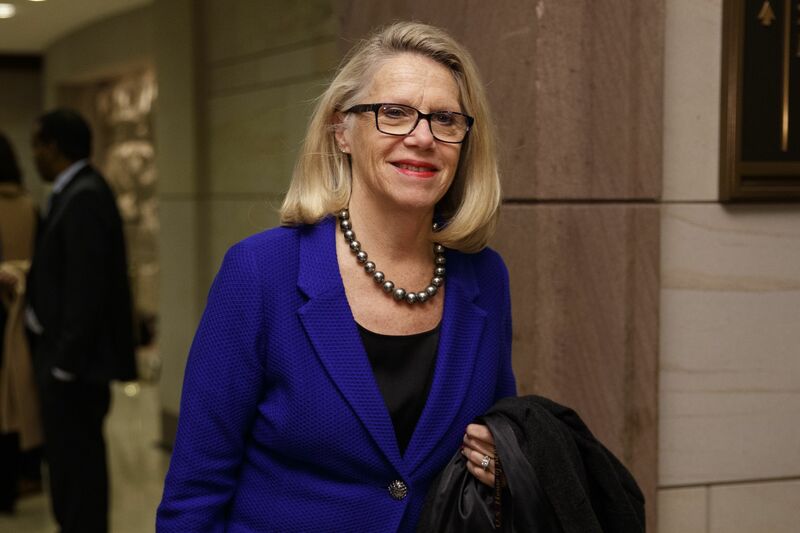 "West Virginia's Carol Miller will be the only Republican woman entering the 435-member House as a newcomer in January. She'll join what may be the chamber's smallest group of female GOP lawmakers since the early 1990s — as few as 13 of at least 199 Republicans," AP's Alan Fram reports. "Democrats will have at least 89." "Numbers like those have Republicans searching for answers to the glaring gender disparity in their ranks." "The concern is that Democrats' lopsided edge among female voters could carry over to 2020, when President Trump will be seeking a second term and House and Senate control will be in play." "Republicans risk being branded the party of men." "You will see a very significant recruiting effort" for female candidates, said David Winston, a pollster who advises GOP congressional leaders. "Evidence of the GOP gender gap [is] just as clear in the 100-member Senate, where Tennessee Rep. Marsha Blackburn will be the only Republican freshman. If Mississippi Sen. Cindy Hyde-Smith wins a runoff later this month there will be record-setting seven GOP women in the Republican-run Senate." "But even that record is less than half the class of 17 Democratic women, which includes two freshmen." The data: "Women backed Democratic candidates over Republicans on Election Day by a telling 57 percent to 41 percent, according to AP VoteCast." "Men supported Republicans over Democrats, 51 percent to 46 percent." Parkland, Fla.: "Fred Guttenberg will start his Thanksgiving morning at a cemetery. His 14-year-old daughter, Jaime, was one of 17 people killed in the Valentine's Day massacre at Marjory Stoneman Douglas High School." Pittsburgh: "Rabbi Jeffrey Myers had just begun Shabbat service at the Tree of Life synagogue ... when the shooting began. Now, less than three weeks after the deadliest attack on Jews in the United States, he ... suggested 'one simple, yet meaningful gesture' that would make an impact. He asked people to count the number of friends and relatives gathered around their tables at Thanksgiving and donate that sum." Mexico Beach, Fla.: "The Rev. Eddie LaFountain of the First Baptist Church in Mexico Beach, Florida, plans to welcome 300 people to the parking lot of his storm-damaged church for Thanksgiving dinner. ... LaFountain's other job as a landscaper dried up since the hurricane, as did his wife's job cleaning condos. ... Just a few days ago, volunteers put a new roof on the church. Inside, the donations of shoes, groceries, clothing and other items are free for the taking." 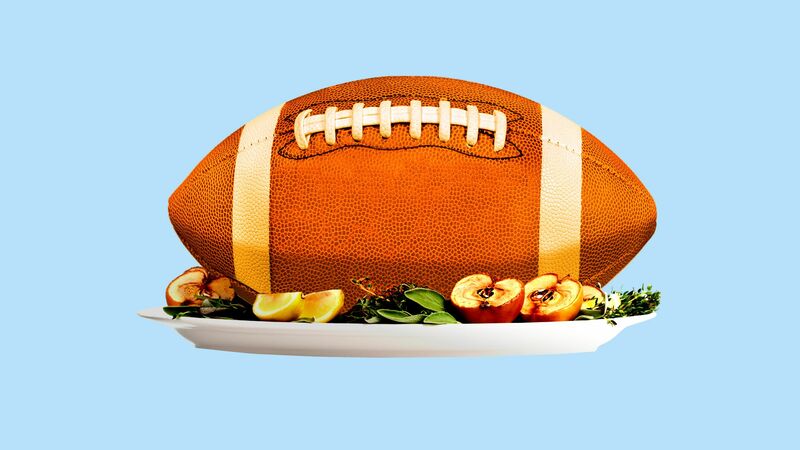 "Hannah Crenshaw hosts a Thanksgiving dinner each year, cooking turkey, stuffing and mashed potatoes — her favorite — for up to 15 guests at her home in Magalia. That's not an option this year. Her house burned down in the Nov. 8 wildfire that tore through the town of Paradise ... Instead, the 26-year-old will be spending Thanksgiving with her husband's family in nearby Durham." "[B]usinesses and hundreds of volunteers have stepped up to ensure turkey, potatoes and pie are available as a small slice of comfort for anyone who wants a plate." "Scores of volunteers also are opening their houses to strangers, to provide a more intimate Thanksgiving." Some of the fire victims "didn't even realize Thanksgiving had arrived amid the chaotic and emotionally draining rush of the past two weeks." "Is that today?" Amy Sheppard asked yesterday, rushing to pack her belongings in a black trash bag as rain fell over a Walmart parking lot where she and many others had camped for days. "Sheppard began to cry as she explained her son was staying with other family after the fire and that they would likely spend the holiday apart." "Kathleen Chavez, who had been her father’s live-in caregiver for more than 20 years, said he passed away peacefully in his sleep." 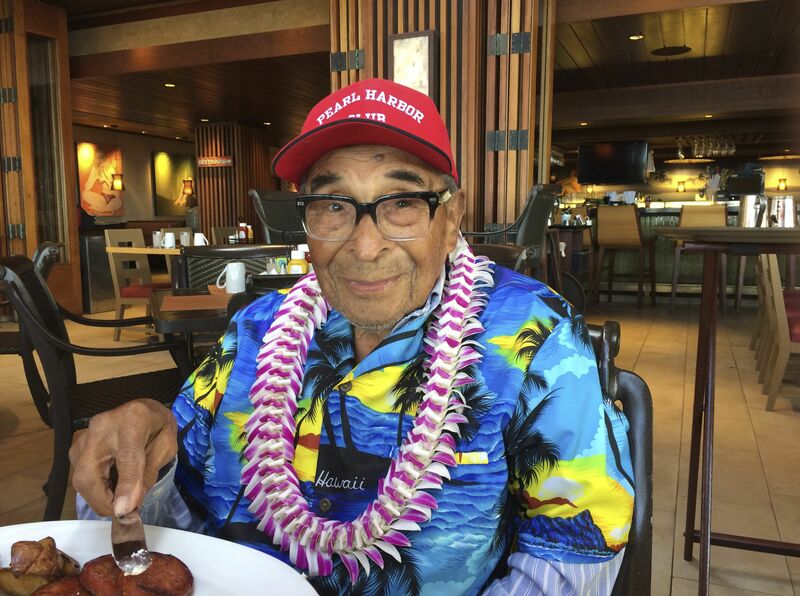 "Chavez surged into national prominence three years ago when fellow Pearl Harbor veterans recognized him as the oldest survivor of the 1941 Japanese attack that ushered the U.S. into World War II." "In 1938, at the age of 27, he joined the Navy and was assigned to the minesweeper USS Condor at Pearl Harbor." "At 3:45 a.m. Dec. 7, 1941, Seaman 1st Class Chavez’s crew was sweeping the east entrance to the harbor when they spotted the periscope of a Japanese midget submarine. After depth charges were dropped to sink the sub in 1,500 feet of water, the rest of the morning passed uneventfully." Chavez "was asleep at home in nearby Ewa Beach when the Japanese bombing raid began at 8:10 a.m."
"At its peak, the Pearl Harbor Survivors Association had 58,000 members. Today, there are fewer than 200, according to Stu Hedley, 97, who heads the association’s now-10-member San Diego chapter." 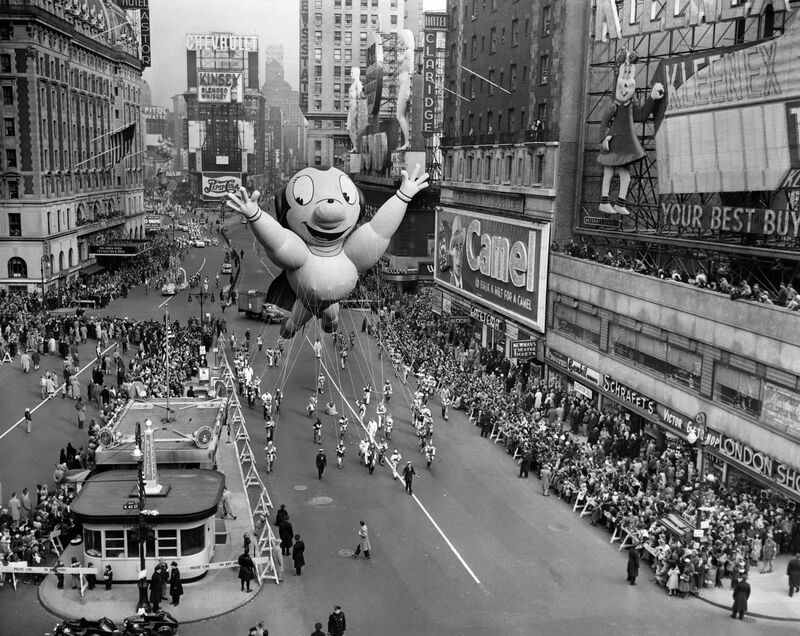 The N.Y. Times posts a trove of photos from Macy’s Thanksgiving Day parades past, with great shots of floats and parade-watchers: Santa Claus riding through the first parade, in 1924 ... the Mighty Mouse float of 1951 (photo above) ... Snoopy skating through Columbus Circle in 1987. It's part of an archival storytelling project, "Past Tense": In collaboration with Google Cloud, The Times is digitizing 6 million archival photos, some dating back more than 100 years. New York Times photographers ... are the people who watch the people who watch the inflatable Snoopy or Betty Boop. ... Look, there’s Kermit the Frog or SpongeBob SquarePants, bigger even than the King Kong on Broadway. The season’s public assemblies to come — Black Friday sales, SantaCon and the New Year’s Eve ball drop in Times Square — are largely adult affairs, but the Thanksgiving parade belongs to the children. The Times also unearthed archival photos of another enduring Thanksgiving tradition: travel woes! "Is this a joke? ... Shut up ... You can't be serious ... I don't think you can microwave a turkey especially that size or you'll blow up the microwave ... You do have an oven, right? ... Don't ever get married." "You don't ... Is this a joke? ... You need to call me." "You can't. It needs to be cooked in an oven. ... It will dry it out. ... It's a big no!! ... This is such a huge disappointment." "I should've never let you move out." "You're done. I'm calling your father." "U should be in charge of napkins or wine or something ... Clearly these friends don't know you." And this is love: "Just buy a choice ... Chicken ... A cooked one ... It's about the gathering, not what you serve." Amen! Enjoy your day, and thanks for starting it with Axios AM.